The December 2018 inaugural St. Mary’s County Fly-In Farmers Market was such a success that two more markets are now scheduled for Feb. 9 and March 16, 2019, said Scott Sanders, one of the organizers of the first Fly-In market. 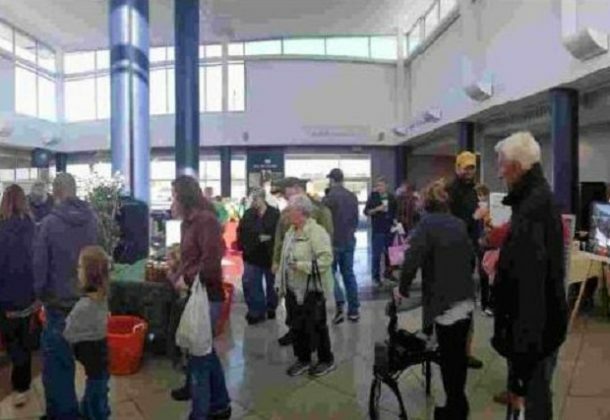 The February and March farmers markets also will be held at the St. Mary’s County Airport terminal building at 44200 Airport Road in California, MD. It will be held 9 am to 2 pm. Mr. Sanders promises “something special” for both winter markets, noting the Feb. 9 date is just before Valentine’s Day. The St. Mary’s County Fly-In Farmers Market is the first of its kind in the nation, Mr. Sanders said. It embraces the rural and agricultural characteristics of Southern Maryland, while highlighting the role our region has had in developing our nation’s air and space technologies. “There is something special in being able to combine these things,” he said. “[The Dec. 22] event was a perfect combination of community coming together with aviation and agriculture, the very basis of the county economics,” agreed Ken Reed, managing partner of S. Hunt Aero. Mr. Reed’s development company partners with St. Mary’s Department of Economic Development and a wealth of technology and aeronautic entrepreneurs turning the airport campus into an Innovation District. During warmer months, St. Mary’s County operates a number of farmers markets and so does Historic Sotterley. “We needed an appropriate interior space for a winter market, said Mr. Sanders, a partner in Tobacco Barn Distillery, one of the local producers finding success through regional farmers markets. The growing high-tech aspect of business development on the St. Mary’s County Airport campus has generated ever strengthening public-private collaborations. So everyone working on the airport embraced the notion. Then Historic Sotterley stepped in as an official sponsor, bringing their experience to the table. “We definitely wanted to be part of this,” said Nancy Easterling, executive director of Historic Sotterley. “I knew this would be a success,” Mr. Sanders said. Mr. Kaselemis gives much of the credit to the community members who made it possible. “It took Tobacco Barn Distillery’s Scott Sanders’ energy and passion for promoting local products and our county to make something out of nothing. Scott worked with Ken Reed of S. Hunt Aero and Nancy Easterling of Historic Sotterley to put the pieces together to make this event. People who missed out this year should put a note on their 2019 calendar to attend next year’s Holiday Market, which I’m sure will be even bigger and better,” Mr. Kaselemis said.